What was it like to serve as an artillery officer during the Second World War? How did he view the battlefield and experience combat? And how did his work with the guns combine with that of the other arms - the infantry, the tanks? Peter Pettit's diary, covering his entire wartime career in the Royal Artillery, edited and with an extensive introduction by John Philip Jones, offers a rare insight into the day-to-day existence of a gunner at war, and it is a valuable record of the role played by the Royal Artillery during the conflict. 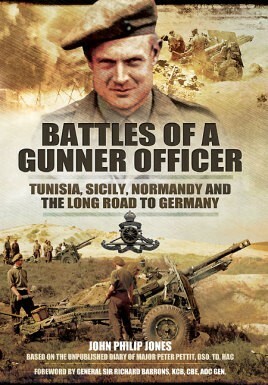 Since Peter Pettit served as a field officer in North Africa, Sicily, Normandy and during the Allied advance across France and Belgium into Germany, his account shows the wide range of challenges that confronted the artillery in different conditions at each stage of the war. Although the landscapes and battlefields changed, the practical problems and acute dangers he faced remained much the same, and he recorded them in the same open and forthright way. His authentic record, combined with John Philip Jones's meticulous description of the planning and progress of each campaign, provide a rounded view the nature of the artillery war and the men who fought it. General Sir Richard Barrons, Commander, Joint Forces Command: 'Professor John Philip Jones breaks new ground as he brings into the light for the first time the private record of one rather special participant. Peter Pettit's personal and contemporaneous notes detail his journey from the first encounters with a determined enemy in Tunisia, through the difficult invasion of Sicily, and finally on to the outstanding events of Normandy in 1944 . . .
. . . This story is made much more interesting and accessible for the general reader by the accompanying succinct historical overview of the events. . .